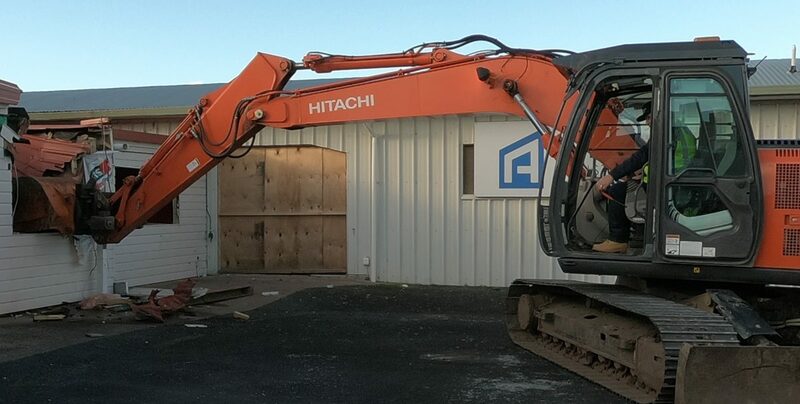 Minister of Regional Economic Development Shane Jones drove a digger bucket through the old Bay of Islands Airport building today to mark the start of construction of a larger and more fit-for-purpose terminal. His demolition effort was watched by members of the construction team, Kipa Munro of Ngāti Rēhia, deputy mayor Tania McInnes, and representatives of Air New Zealand and Far North Holdings. Mr Jones said the redevelopment of Bay of Islands Airport would benefit Far North residents and the local tourism industry. “I’m proud that the Provincial Growth Fund was able to support this,” Mr Jones said. “Local government and stakeholders in the region should be commended for their combined efforts to formulate a business case and bring it to central Government as an investment-ready proposal”. Far North Holdings director Kevin Baxter said Mr Jones’ adventure on the digger marked “the start of a bright new chapter in the story of this District’s drive to develop a world-class tourism product that can compete on every level with the very best that Aotearoa has to offer. The airport terminal was the first of six “shovel ready” projects championed by Far North Holdings to receive funding from the Provincial Growth Fund (PGF), designed to upgrade key items of infrastructure that underpin the Far North tourism industry and wider economy. The terminal upgrade project is expected to cost $4.75 million, with $1.75 million from the PGF enabling the inclusion of a baggage screening area to future-proof the new terminal against requirements for such a facility by CAA. Work is expected to be complete by May 2019.